Monday afternoon Governor Greg Abbott issued an executive order designating Wednesday, Dec. 5, as an official Day of Mourning for our 41st president, George H.W. Bush. SFA will remain open Wednesday and will observe this special day with several commemorative activities. President Bush’s service to our country was exemplary and should be an inspiration to each of us as we seek to serve those within our community, state and nation. He was a friend to SFA, and that friendship is commemorated by the wreath and flags that have been placed at the display of his handprints in the Baker Pattillo Student Center Spirit Lounge. Tomorrow the Carillon Bells at Turner Auditorium will toll every hour on the hour as a sign of reverence and mourning. In addition, I hope you all will join me in a brief moment of silence at 9 a.m. to remember President Bush. 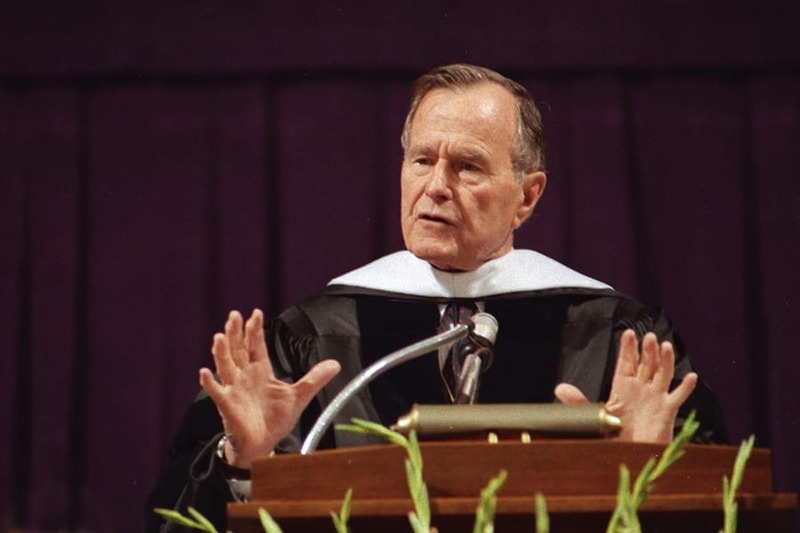 To honor the memory of President George Herbert Walker Bush, SFA’s College of Fine Arts will add to the carillon bells that ring from the Griffith Fine Arts Building. From 8 a.m. to midnight on Wednesday, Dec. 5, the Griffith Fine Arts carillon will toll 12 strikes in a symbolic representation of the remarkable lifetime of George H.W. Bush. The tolls will follow the traditional Westminster chime at each hour. A wreath is displayed in the Spirit Lounge at the Impressions of Leadership monument. A moment of silence at 9 a.m. (Central Time). Students who wish to watch the service are encouraged to gather in the Axe Handle Lounge in the Baker Pattillo Student Center. Remembering former President George H.W. 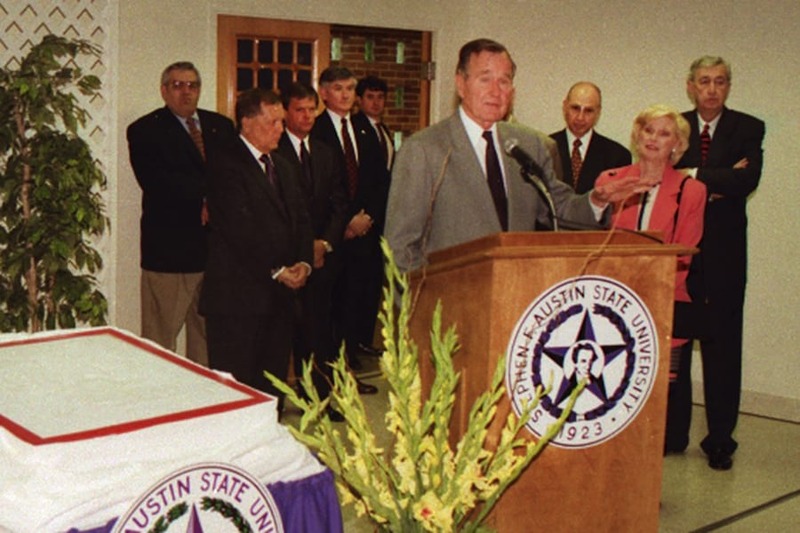 Bush and extending deepest condolences to his family, the university looks back at the contributions he made to SFA. 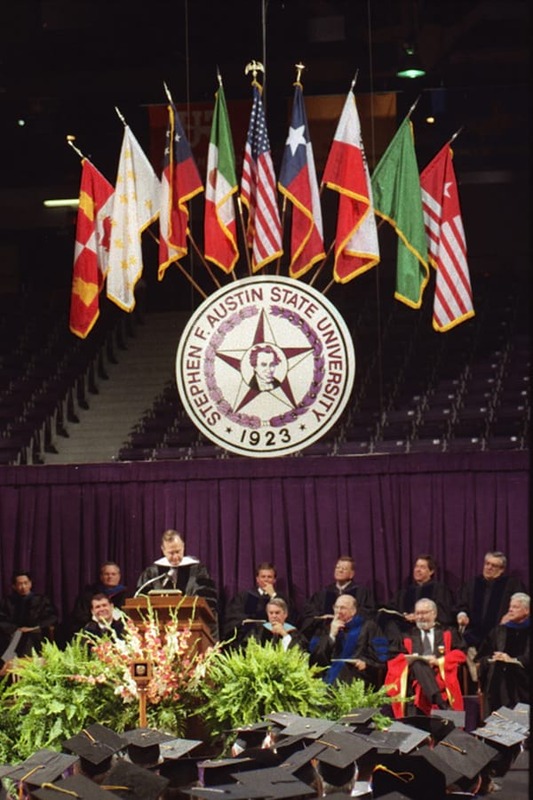 Following his commencement address, he provided his handprints and signature for a display in SFA’s Spirit Lounge, a tribute to leaders who have made a permanent impression on the university. His handprints are joined by those of his son, former President George W. Bush, as well as handprints of former U.S. Senators Phil Gramm and Kay Bailey Hutchinson and former Gov. Rick Perry. 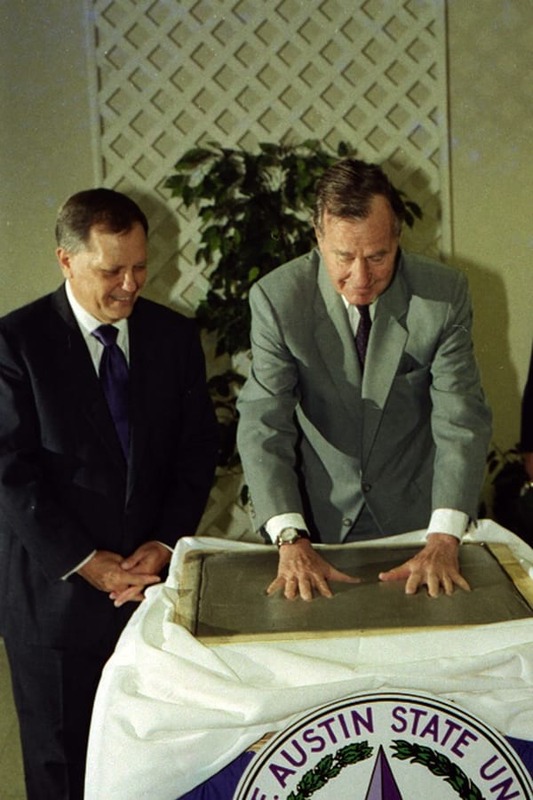 Displayed in the Baker Pattillo Student Center Spirit Lounge, the handprints ensure that Bush’s legacy will live on and the contributions he made will never be forgotten. 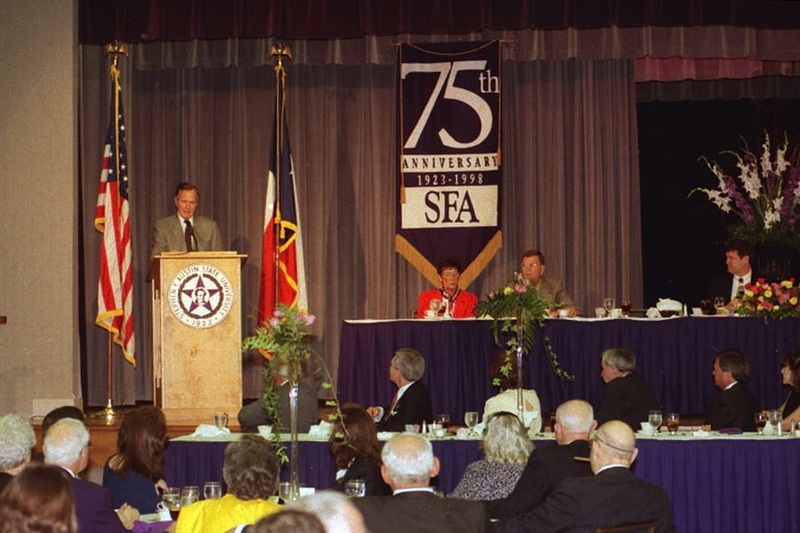 Bush spoke at SFA’s Academic Convocation during the university’s 75th anniversary celebration in 1999, where he was conferred an honorary doctoral degree.